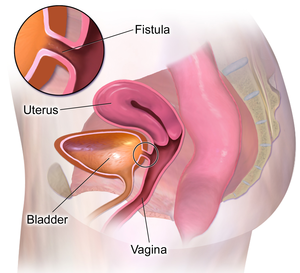 Fistula is defined as the way of communication between two of the epithelium layers and colovesical fistula is the communication between an organ i.e. bladder and GIT. Its common presentation is the recurrent (repeated) urinary tract infection UTI. This communication is made as a result of malignancy, anastomotic leaks, trauma, entrance of foreign body, radiation, adhesions, divertible disease and also made before any abdominal surgery especially in bowel’s disease. Colovesical fistula may also occur due to malnutrition. Men are more susceptible to it as compare to women. About 67 to 80% cases reported colovesical fistula after the abdominal surgery. Urinary tract infection is the commonest symptom reported. It may be chronic and recurrent episodes may also occur. Pneumaturia (condition in which fistula occurs between bowel and bladder and as a result gas pass out along with urine from urethral opening. Dehydration can also be seen with colovesical fistula. There may be many techniques associated with diagnosis of colovesical fistula. Cystoscopy: this technique normally not able to show opening. CT scan: this technique can show even a small amount of air bubble in the bladder which shows the presence of Pneumaturia. Contrast enema: this technique can show the fistula bigger in size but cannot show the small one. Sigmoidoscopy: this technique shows the accumulation of mass around the site of fistula along with inflammation at that site. Pyelography and cystography: these two techniques are also used to diagnose the connection of urinary tract with nearby organs. Colonoscopy may be done for the patient with colovesical fistula in Pneumaturia. In the one stage operation, 1st the anastomotic connection which is sewn by hands is made between the colon and bladder in the absence of colostomy. After cutting off the fistula, the anastomotic connection may show defect after the catheter is inserted for 7 days. And after that the patient is called for follow ups to check the recurrence of colovesical fistula. If the treatment requires only palliation then the following treatment options can be selected. The patient who have undergone surgery of colovesical fistula may recover from surgery in an average of 7 to 8 days. But the time may vary with patient to patient. Most of the patients show recurrent urinary tract infection UTI and diverticulitis after surgery which will increase the recovery time of patient. But the patients showing no recurrent urinary tract infection UTI may recover within a week. A case reported that the patient even start eating properly with regular bowel movements after 7 days colovesical fistula surgery. A women reported with occurrence of diverticulitis after surgery which elongates the time of recovery.